Markham Infiniti | Blog | Markham Infiniti Reviews the 2017 Q50 3.0t AWD! Markham Infiniti Reviews the 2017 Q50 3.0t AWD! 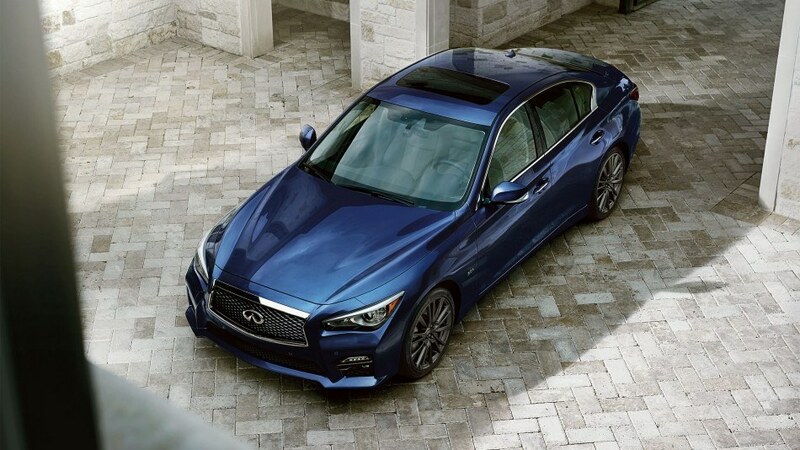 The 7 speed automatic Q50 3.0t AWD has automatic dual transmission coolers, adaptive shift control, driver adaptive learning algorithm senses, manual shift mode and downshift rev matching. There are four modes for drivers including standard, snow, sport and personal or eco. 2017 Infiniti Q50 3.0t AWD is an all wheel drive with hill start assist, electronic power steering, active trace control, independent double wishbone shock absorbers and multilink suspension, ventilated disc brakes on all four wheels, all season tires, LED headlights and fog lights, LED brake lights and center stoplight, comprehensive airflow management, solar glass, powered moonroof with tinted glass and one touch operation, tilt & sliding sunshade. View our inventory. 2017 Q50 3.0t AWD offers many features including remote keyless entry, touch selective unlocking, remote engine start, powered and heated outside mirrors, LED signal lamp, auto dimming, rain sensing wipers in the front and rear window defroster. The exterior has scratch shield paint. 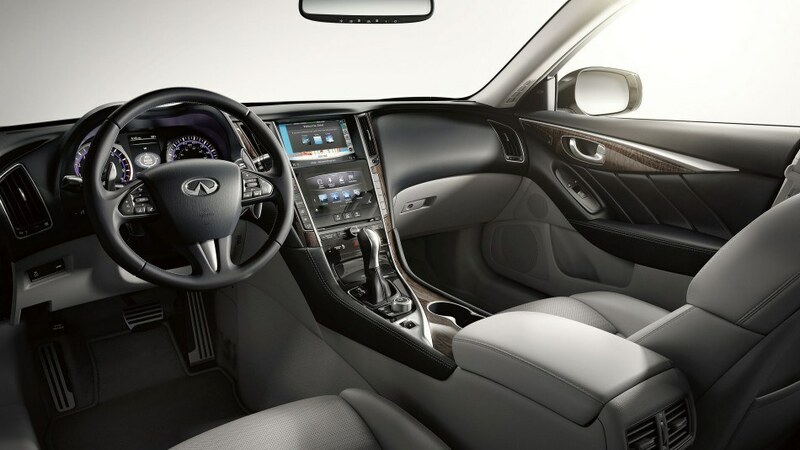 The sedan is a convenient and comfortable drive with Infiniti Intelligent Key, push-button ignition, dual-zone climate control with advanced features like auto recirculation, air purification and micro filter, air vents and heater ducts in the rear, powered door locks and windows, valet key, trunk lockout, overhead map lights, reading lights, front armrest, two 12V power outlets, two USB ports, rear center armrest, storage compartment and cup holders. The interior highlights will make you fizzle with excitement including the leather upholstered seats, Kacchu aluminum trim, 8-way power adjustable driver’s seat with lumbar support, power adjustable front passenger seat, dual occupant memory for the driver’s seat including steering wheel and mirrors, heated front seats and heated steering wheel. 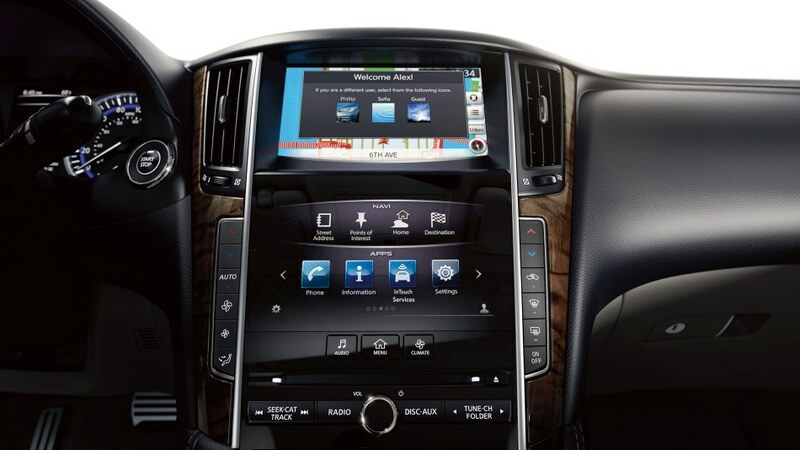 Q50 3.0t AWD has a 16-speaker Bose audio system with component front door speakers and 10” subwoofers, radio data system, volume control with speed sensitivity, Sirius XM compatibility, InTouch Navigation, Infiniti Connection, Bluetooth, RearView and Around View. 2017 Infiniti Q50 3.0t AWD has your safety covered with front airbags, side impact airbags and roof-mounted airbags, pretensioners, load limiters, emergency locking retractor, LATCH, brake assist, electronic brake force distribution, anti-lock braking, tire pressure monitoring system and Vehicle Security System and more. If you’re in the Toronto area, we invite you to book a test drive at Markham Infiniti today! 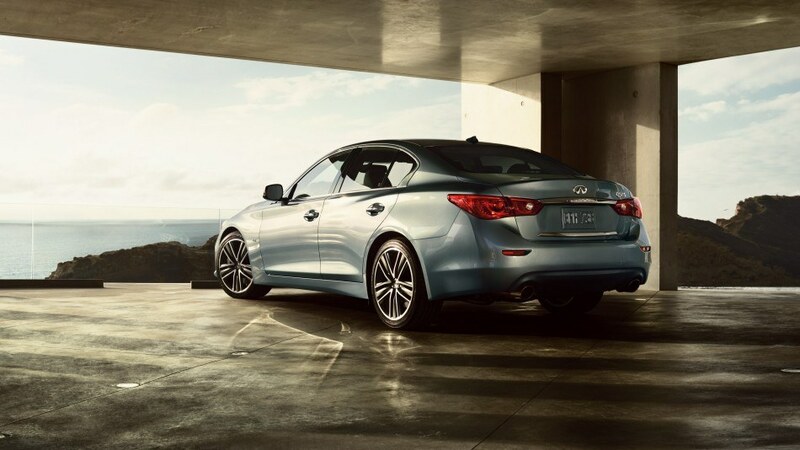 View the Q50 3.0t AWD on Infiniti Canada.